Joel Pfister, Olin Professor of English and American Studies at Wesleyan University, has written six books, most recently Surveyors of Customs: American Literature as Cultural Analysis (Oxford UP, 2016), and co-edited one volume of essays, Inventing the Psychological: Toward a Cultural History of Emotional Life in America (Yale UP, 1997). He has served as chair of two departments: English and American Studies. Pfister began his graduate education in American Studies in Europe, at the University of London (M.A. ), and also studied at Columbia University (B.A. ), the University of Sussex (M.A. ), and Yale University (Ph.D. in American studies). 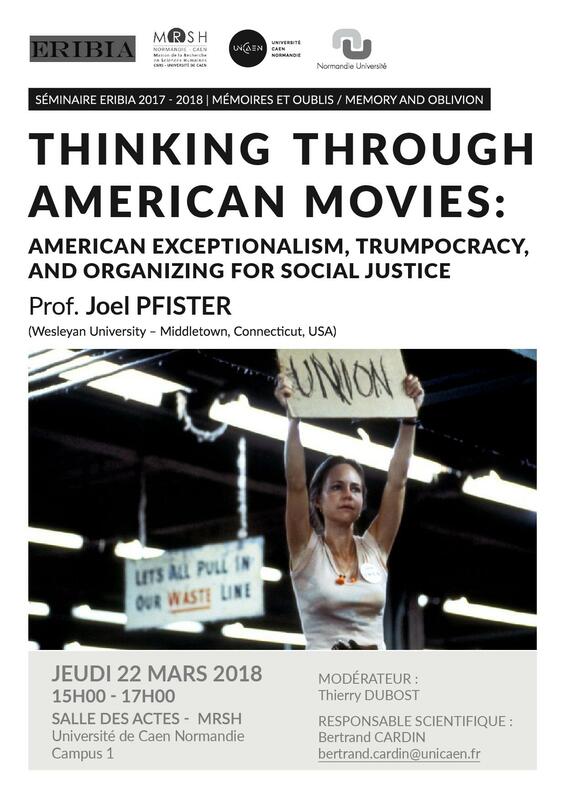 Pfister previews a few key themes he is developing in his book-in-progress, Movies and the Americanization of Power, which reconsiders some movies from the 1930s to the present as innovative critical resources for American studies. Although movies are products and symptoms of “soft capitalism,” Pfister argues that some self-reflexively provide the most revealing critiques of Americanized “soft capitalism.” Some bluntly challenge the ideology of American exceptionalism. Moreover, some movies reframe America as a plutocracy that employs “democracy” as one way of “dressing-down" top-down power to look bottom-up (blatant in Trumpocracy). Although many movies reproduce ideologies of individualism, some offer provocative strategies for organizing for social justice. These movies teach us much about the Americanization of power.